"...but I suspect individual campaigns don't vary as wildly in this respect as they used to do." Being extremely insulated myself, I can't provide any solid evidence to dispute this claim. But I know for certain that my campaign - in any game - is just that: my campaign. I house rule the crap out of every game - I just like to tinker with things. Or maybe I'm just a control freak, like everyone says. :P Either way, I highly suspect that there is more variation than you think - at least among groups that include players who have been at it for more than a decade or two. I've noticed that things are different for both games I run, yet some things are familiar. I have to shift gears to go from post-apocalypse mode to 'standard D&D mode'. It's even obvious from the PbP games that I'm involved in. I do think that those types of differences are still apparent. You always have a welcome seat at our table should you find yourself down in the Windy City. In the past 3 weeks I've played with 3 different groups using 3 different gaming systems: OD&D, BECMI, and Empire of the Petal Throne. The BECMI group is my weekly group and I am probably going to join the EofPT group, too. In each instance, I had a wonderful evening of gaming. In each instance, I had a completely different gaming experience. I strongly encourage anyone with a chance to do so: seek out other gamers, even if only for a one-off adventure. I know I pretty much houserule the heck out of anything I run, and most GM's I play with do the same, to some degree. However, none of us run D&D 4th ed, and I suspect that groups that are willing to play games that are a little more out of the current mainstream may be more willing to alter whatever rules they're using. 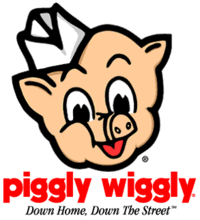 As an aside, seeing the Piggly Wiggly logo was pretty much the last thing I expected to see on Grognardia. I grew up in a small Southern town, and PW was the main grocery store in that area. I like what you wrote about people arguing on internet forums rather than playing. That made me laugh! I agree with you on the isolation. I've had a much harder time than I thought I would in finding a people willing to try new games. I live in a city with 4 million people and if I found 4 willing to play Labyrinth Lord I'd jump for joy. Wow James, a lot of the things you miss about other people and their games are a lot of the reasons I pretty much retired as a player to only DM years ago. I don't know if other people have felt this way, but I just thought that (without tripping over my own ego) most of the games I tried in the 90's were inferior to mine. There alre local "meet-ups" in LA for D&D, but they always sound more like social gatherings than actual play "generate a 12th level character, and meet us at the Carrows on Main Street." I do remember that as a kid, there were regular games at a couple of the local libraries, but nowadays the best you can do is some "game day" that is made up of parents trying to get their kids into gaming - and it usually ends up being a couple of adults at the D&D table, and kids who quickly get bored and wander back and forth to other tables. Big fun. So I have just settled into my own little cut-off gaming group. It's intimate, it's regular, and it's mostly the same people. That is the recipe for decent gaming for me nowadays. @Brunomac: I know the Austin one results in games. and probably more I'm missing. While most games are modern, short lifespan we do cross over continuously on who is playing what in terms of GM, rules, systems, etc. Honestly, this is one thing I can't say I miss. I have no really stable group and if it were still in force, I'd probably get confused from the scads of different DMs I've played with in the past. The first campaign I played in extensively was rather thoroughly house-ruled (and I've written about it here. But that wasn't my only experience with house-ruled campaigns. There was one fellow I knew of through my friends in high school who had a completely home-brew system (had to be '77 or '78). There were psionics, things were determined on a lot of percentile rolls, and combat was NOT like D&D and it was DEADLY. I felt completely out of my comfort zone and totally exhilarated when playing in his game - my character was from a middle-class background, and the spell I knew the best was a kind of sense-dulling effect that I could cast over and over again. This allowed me to defeat some monster at the time by making it incapable of sensing me. I didn't play often in that game, but I appreciated it for being really DIFFERENT. I think there might have been a couple of things that brought this era or complete gonzo experimentation to an end. One thing was the emergence of new role-playing games. New games charted out ideas in different ways, so if you really didn't like something, you simply came up with something entirely different! The other thing that might have contributed to this was the publication of AD&D as a kind of implicit (or explicit) standard for play. I agree with Herb's advice to Christian and others: if you want to find a game, (re)start a gaming club. There's more good advice here - though you might find his tone off-putting, the actual content is spot-on. So it does still seem like "visiting" is possible here, even if it's just to another table in the same pub. I had to flit through 4 or 5 groups before settling on my current group, which has actually moved away from the pub to a house because it's too crowded. This is a big contrast to Australia, where i had to fight to find any kind of group at all, though it did seem easier 10 years ago. Maybe Australia and Canada have something in common? Back when I was in either sixth or seventh grade (this would have put the year at either 1984 or 1985), my middle school had a Dungeons and Dragons seventh period elective every Friday. Can you even imagine that happening nowadays? Anyhow, I got to DM a game and play in 2-3 other gaming groups, which was a real eye-opener. I still vividly recall one group in which every PC was an assassin, and they spent the whole game trying to kill each other by rolling on the old 1E assassination tables. It was great! The only time the group demonstrated any solidarity was the time some new guy joined and brought in his paladin PC. They all ganged up and killed him, gave each other high-fives, then went back to trying to murder each other once more. I think the loss of "campaign visiting" has a lot to do with the increased desire for verisimilitude in our gaming. But I don't think this style of gaming is quite as dead as you think. I just got done directing a play at a local high school: There's an RPG club there. Several of my cast members have regular Shadowrun and GURPS campaigns. Their campaigns sound a lot like the campaigns I used to run. On a similar note, I'm currently in the process of prepping a West Marches campaign where my table will have a rotating group of players. Right now I've got 12+ people definitely interested in participating. This type of campaign will feel a lot more like the way I used to game.